Nicely done, beef. You give people a reason to use the drooling emoji. Visit iabeef.org for recipes, cooking tips, Iowa farmer profiles, and nutritional information. 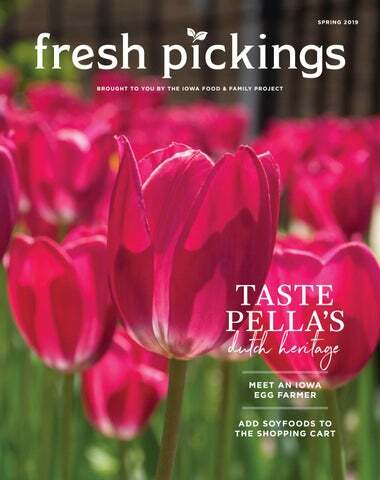 WELCOME TO THE INAUGURAL ISSUE OF FRESH PICKINGS MAGAZINE! HERE, YOU’LL FIND STORIES THAT CELEBRATE THE INCREDIBLE FOOD, FARMS AND FAMILIES THAT MAKE IOWA A SPECIAL PLACE TO LIVE. THIS QUARTERLY PUBLICATION IS BROUGHT TO YOU BY THE IOWA FOOD & FAMILY PROJECT – AN INITIATIVE THAT INVITES IOWANS TO EXPLORE HOW FOOD IS GROWN AND RAISED AROUND THE STATE AND MEET THE FARMERS WHO MAKE IT HAPPEN; 24/7, 365 DAYS A YEAR. WE NETWORK WITH NEARLY 35 FOOD, FARMING AND HEALTHY LIVING ORGANIZATIONS WHO ARE PROUD OF IOWA’S HOMEGROWN FOODS AND HOMETOWN VALUES. YOU CAN LEARN MORE ABOUT OUR PARTNERS ON PAGE 6. AISLE INSIGHTS: WHAT’S IN A LABEL? ON THE COVER: A garden filled with tulips adds to the ambiance of Pella Tulip Time, the town’s annual community celebration. Thank you to the Iowa Soybean Association, Iowa Pork Producers Association, Iowa Beef Industry Council, Midwest Dairy, Iowa Corn Growers Association, Iowa Egg Council, Farm Credit Services of America, Corteva Agriscience, Iowa Select Farms and Key Cooperative for the financial investment that makes this publication possible. Join the Conversation Whether it’s been a cheesemonger describing a dreamy gouda or a soybean farmer sharing photos of her family’s six-generation farm legacy – each has graciously shared their excitement and helped expand my world a bit more. Like most Iowans, I did not grow up on a farm. I’m a ‘city girl’ through and through. Before starting this position, I honestly didn’t think much about farm life – it was something distant and unfamiliar. It wasn’t for lack of respect; I simply hadn’t joined conversations about agriculture and food production. And now that I have, these stories have bubbled over and stuck with me. ime seems to stand still when you’re with someone who is passionate about what they do. Their energy captivates and inspires you in the moment. And if you truly connect, their excitement sticks with you, coming to mind months later or showing up in places you hadn’t noticed before. During my time with the Iowa Food & Family Project, I’ve had the opportunity to share so many conversations with passionate Iowans. innertime is a celebration of my favorite things – food, family and time-honored traditions. It’s a chance to stop and connect during the busy seasons of life. As a mom and farmer, I have a lot of plates spinning at one time. Between kids’ activities and the responsibilities on the farm, it can sometimes be difficult to get a meal pulled together – even though gathering around the dinner table is so important to me. Cristen Clark is a pig farmer, creator of the Food & Swine blog and award-winning baker and cook. She lives on a farm near Runnells with her husband Mike and children Halle and Barrett. dish bright and flavorful. My kids love customizing the bowls with their favorite toppings. I love the bowls because they keep the whole family satisfied through an evening of sports practices, chores and homework! I’ve found the key to this recipe is to cook the pork quickly over medium high heat. This helps maintain the pork’s juiciness and delicious flavor. When it comes to cooking pork, whole muscle cuts – like pork loin, pork tenderloin and pork chops – should be cooked to a safe internal temperature of 145 degrees F, as recommended by the USDA. Once the meat has reached the desired internal temperature, remove it from the heat and allow it to rest for at least 3-5 minutes to let the juices redistribute. Kitchen gadgets seem to be all the rage these days, from air fryers to power pressure cookers and more. The tool I rely on most is my digital instant read thermometer. This kitchen musthave helps take the guesswork out of confirming doneness when grilling, cooking and baking. mixing bowl. Toss gently to incorporate. add to skillet. Discard remaining marinade. Stir fry pork quickly for a few minutes, until golden brown. rice and fold mixture until rice is coated. pepper, orange juice and zest. cooked pork loin strips. Garnish with optional guacamole, fresh cilantro, avocado, shredded cheese, sour cream or hot sauce. Iowa families have a powerful new support circle. MercyOne now has more highly-rated specialty services than any network in Iowa. And more than 20,000 health-focused team members with one missionâ&#x20AC;&#x201D;to help you live your best life. any Iowans are plagued by seasonal sniffles, which can be sent into overdrive during the spring. Tim McCoy, D.O., MercyOne Des Moines Medical Center Family Medicine Chair, shares the basics of seasonal allergies and ways to lessen their effects. WHAT ARE SEASONAL ALLERGIES? The generic term “allergies” can mean different things to everyone. Patients with allergic rhinitis – the diagnosis most have – can experience seasonal effects because of pollen from trees, plants and grass. HOW MANY PEOPLE ARE AFFECTED BY SEASONAL ALLERGIES? Allergic rhinitis is an incredibly common condition. Some studies say it affects 10-30 percent of children and adults in the U.S. and can be tied to family history or genetics. IS ALLERGIC RHINITIS PRESENT AT BIRTH? Seasonal allergies are very uncommon in children under 2 years old. It usually takes a few years of exposure to develop the condition. CAN PEOPLE DO ANYTHING TO PREVENT SEASONAL ALLERGIES? preventing allergic rhinitis. There have been some small studies indicating prenatal probiotics can decrease the risk of eczema, which is an allergic-type skin condition, but further research is needed to confirm the effectiveness. WHAT CAN PEOPLE WHO SUFFER FROM SEASONAL ALLERGIES DO TO LESSEN THE SEVERITY? There are a variety of medications and treatments available, so patients should consult their family doctor about their specific situations. Sometimes over-the-counter medications, prescription oral medications, nasal sprays and eye drops can be effective. Some patients benefit from scheduled allergy injections to make themselves “non” allergic to the specific allergens. The best way to prevent seasonal allergy symptoms is to reduce exposure to pollens. Monitoring the pollen forecast and staying inside at times when the pollen count is highest – between 5 and 10 a.m. and again at dusk – is a good way to limit exposure. In the spring, people with allergies may find relief by keeping their car and home windows closed and showering or washing their clothes after spending time outside. reels to digital formats in the early 2000s spelled trouble for the small-town cinema. By 2015, it had closed and fallen into disrepair until a motherdaughter duo stepped up to save the local landmark. Marianne Fons of Winterset, and her daughter Rebecca, who commuted home from Chicago during the two-year renovation, led the charge in restoring the theater to its former glory. Realizing the economic impact for the community, Fons says they were motivated by the spirit of smalltown values. “You can stream all of the movies you want at home, but it’s not like the shared experience of being among your community,” she says. “The Iowa Theater is a place for kids, families and friends to make memories, and I hope it continues to do that for decades to come.” Today, the nonprofit movie theater is owned by the Winterset community and serves as a performance space and a place for locals and visitors to come together. It’s a hidden treasure of Madison County and a historic point of pride for Iowans. The renovated Iowa Theater in Winterset takes a step back in time while offering a modern cinematic experience. A successful community project has breathed new life into the old movie house. FOR YOUR CHANCE TO WIN A $25 ETHANOL GIFT CARD. Bruce Dooyema is a third-generation farmer in northwest Iowa and one of the owners of Center Fresh Eggs. Above: Hens move around one of Center Fresh Eggsâ&#x20AC;&#x2122; cage-free hen houses. Left: Eggs are washed while moving through the production facility. ruce Dooyema asked his parents for a dozen baby chickens as part of a school project when he was 13 years old. His parents instead bought two dozen. This school project led to a lifelong career and passion for global egg production. Eggs have long been known for their incredible nutritional qualities, aptly earning the slogan of “the incredible egg.” With Dooyema’s vigor, it’s not surprising what goes into Center Fresh’s production is just as incredible. Today, Dooyema works alongside family members and business partners to operate Center Fresh Eggs. A far cry from his early days of egg production, the company has 11 million egg-laying hens and 2.5 million pullets – young hens who have not started laying eggs – and is one of the largest egg producers in the country. Center Fresh has operations in four Iowa counties, and thanks to Dooyema, in the African nations of Mozambique and Zimbabwe. This year, a farm will also be started in Zambia. Dooyema is passionate about providing exceptional care for the hens, being a good steward of the environment, contributing to his community and helping developing countries to learn how to raise affordable and nutritious food. He’s served on the American Egg Board for the past 18 years, and his sustainable approach recently led to appointments on the International Egg Foundation Board and World Poultry Foundation Board. “After successfully raising two dozen chickens, my parents put up a 60,000-bird hen house the summer before my freshman year of high school,” Dooyema shares. With Dooyema’s dad, Junior, in his mid-50s and putting in long, hard labor hours as a dairy farmer, his son’s interest in egg production provided an opportunity to re-focus the family farm. “We had 60 milk cows, a 50 farrow-to-finish hog operation and 100 steers – our operation was iconic of farms in the 1970s. We did a lit bit of everything,” Dooyema says. ONE EGG CONTAINS 70 CALORIES, 6 GRAMS OF PROTEIN AND ALL NINE ESSENTIAL AMINO ACIDS. Bruce Dooyema examines eggs as they are sorted and moved through the production facility. His brother Eric purchased the dairy and operated it until a fire in 1986 ceased production. That’s when the Dooyema family expanded with another facility, which housed 80,000 more hens. With 140,000 birds, Junior estimated the family needed 1 million hens to stay in business and provide a viable livelihood for himself and sons Kim, Bruce and Eric. I N IOWA, 57 MILLION LAYING HENS PRODUCE 16 BILLION EGGS EACH YEAR – ENOUGH TO FEED EVERY AMERICAN FOR 47 DAYS. In the mid-1990s, the egg industry was consolidating. They knew – along with several area egg farmers – to stay in business they needed to combine assets, share expertise and become one company. Center Fresh Eggs was born in 1996. NUTRITIONAL POWERHOUSE The consolidations came as egg consumption was growing. It didn’t happen overnight, however. In 1984, TIME magazine dealt a blow to the industry by dubbing eggs as a bad source of cholesterol. Today, the egg industry has come a long way from the famous cover story that made eggs the villain when it came to heart disease. It’s a fascinating reminder of the improvements in understanding human nutrition and heart health. Recent recommendations from the American Heart Association, American Diabetes Association and the 2015 Dietary Guidelines for Americans no longer limit cholesterol intake and include eggs as part of healthy eating patterns. Eggs provide high-quality protein and unique nutrients such as choline and lutein, making them a perfect complement to any diet. At an average cost of 17 cents per serving, eggs are an affordable source of highquality protein. Hatching Success Across the Globe A visit to Mozambique in 2006 inspired Dooyema and his brothers Kim and Eric to bring modern egg farming practices to the African country. They helped build a modern, fully integrated egg facility in Mozambique that allows local egg farmers to produce nutritious and safe eggs to help feed the county’s growing population. Hen health is the most important priority for Bruce Dooyema and Center Fresh Eggs. proper light; quality water, feed and ventilation; and sanitary conditions. For example, a day-old pullet needs air temperature around 92 degrees F, while a young bird thrives at 70 degrees F. As hens age, optimal temperature is around 80-82 degrees F. Dooyema says every Tuesday managers discuss what’s happening with each flock. The team analyzes weather conditions – adjusting for warmer or cooler temperatures – and the age of flock to determine the rations. The age of bird and the diet affect the size of the egg. Most people want to buy large eggs at the grocery store, so the key is to manage the diet so the eggs are the right size. “It’s how we make our living – and we want a healthy food supply, so we are doing everything possible to keep our birds happy,” Dooyema explains. “When birds are happy, they lay more eggs. a new farm, they also launch a technical training school called Ebenezer. Students live on campus for two years and are trained on how to grow produce, crops, broilers and manage layer houses. “This ensures they will have the skills to go into their own communities and start whatever type of agriculture that interests them,” Dooyema explains. Beyond teaching, Center Fresh’s priority has been to reduce disease pressure. Because hens were in uncontrolled environments, disease spread rapidly on the ground, often wiping out 50 percent of flocks. Dooyema built a simple cage system — which has received enormous praise from the president of Mozambique — that has led to happier and healthier hens. A similar project was developed in Zimbabwe and another is planned for Zambia. TODAY, THE MOZAMBIQUE PROJECT HAS 100,000 LAYERS AND 60,000 PULLETS. Butterfly Heroes H OW FA R M ER S , Z O O S A N D Y O U C A N P R O T E C T P O L L I N AT O R S While monarch populations have declined dramatically in the past 20 years, Iowans are working together, from the farm to the city, to add habitat that helps these magnificent creatures survive and thrive. all them the rock stars of the insect world. Majestic monarch butterflies are one of the most beloved butterfly species in North America. These colorful creatures have introduced school children to the wonders of nature for generations. They’ve also motivated scientists to study the delicate insects’ annual 3,000-mile migration, which requires multiple generations and is one of the most miraculous natural events on Earth. It’s estimated there are more than 100 varieties of milkweed in North America. Monarchs use milkweed plants to lay eggs. “All of Iowa’s acres fall within the prime range of the monarchs’ breeding habitat,” says Dana Schweitzer, program coordinator for the Iowa Monarch Conservation Consortium at Iowa State University. Yet all is not well with monarchs. In the 1990s, nearly 700 million monarchs made the epic flight each fall from the northern plains of the U.S. and Canada to sites north of Mexico City. “Pollinators such as monarchs are essential to life, because they help produce one-third of the global food supply,” says Jessie Lowry, director of conservation and research for the Blank Park Zoo in Des Moines. “The loss of monarch habitat in the past 20 years has created some serious challenges.” Before they migrate south, the monarchs make Iowa their home for the summer. only eat milkweed plants, and monarch butterflies need milkweed to lay their eggs. Adult monarchs, however, can consume the nectar of many blooming flowers and plants. Fortunately, habitat loss is something that can be addressed close to home. “Areas as small as 3 by 3 feet with the right mix of plants can create ‘pollinator pit stops’ for monarchs,” Lowry says. These patches of habitat, filled with native flowers and other plants, can be grown near homes, churches, schools, retirement communities, farms, ditches and other areas. More Iowans, from the city to the country, are adopting this community approach to creating pollinator habitat. The Iowa Monarch Conservation Consortium, for example, is made up of nearly 40 organizations, including agricultural commodity groups, nonprofits, private industry, utility companies, conservation groups, government agencies and others. “We’re looking at this issue from many different viewpoints to help add more habitat in unused areas of farmsteads, yards, acreages and businesses,” Schweitzer says. COMMON SENSE CONSERVATION ON THE FARM Farmers play an important role in the process. The Iowa Monarch Conservation Consortium has been reaching out to farmers and landowners through educational exhibits at events such as the Farm Progress Show near Boone. “Since we began offering information at the show several years ago, the level of engagement has soared,” Schweitzer says. “Compared to previous years, we fielded significantly more questions from farmers, landowners and other attendees at the 2018 Farm Progress Show who were seeking information on adding pollinator habitat.” Wayne Fredericks, a soybean and corn farmer from Osage, was inspired to add pollinator habitat to his land after learning about the monarchs’ declining populations. During his 45-year farming career, he has seen many changes that have altered the monarchs’ summer breeding and feeding habitat, including the decline of milkweed plants. Weeds, including milkweed, are undesirable in farm fields because they compete with crops for light, water and nutrients. “Farmers did not diminish monarch habitat intentionally,” Fredericks says. “When Roundup® Ready soybeans came along in the mid-1990s, it became easier to control weeds. Before that, patches of milkweed would often survive in the fields, and you’d see little puffs of fluff when you were combining.” When the overwintering monarch population in Mexico hit a low point in 2012-2013, environmental groups petitioned the U.S. Fish and Wildlife Service to list monarchs on the endangered species list. Farmers are concerned about this issue and believe partnerships are key to finding solutions, Fredericks says. As a fourth-generation farmer and American Soybean Association (ASA) director, Fredericks has made collaboration a priority. He represents ASA on the Monarch Collaborative, a national group of farmers, scientists, conservationists and private-sector leaders working together to strengthen monarch populations and habitat. “My philosophy is that monarch habitat and production agriculture can coexist,” says Fredericks, who participates in Conservation Reserve Program (CRP) and has partnered with Pheasants Forever to develop a seed mix suited to his acres, including Black-eyed Susans and other blooming plants. Soybeans are the world’s top-produced oilseed crop, grown on about 84 million acres across the eastern twothirds of the U.S. With so much land in production, soybean farmers have great potential to impact pollinating insects. Since 2014, Fredericks has added seven small areas of pollinator habitat on his land, from a 3.2-acre plot near a pond to 0.7-acre pollinator plot in a filter strip, which controls runoff. “That’s a win-win, since it benefits pollinators and water quality,” he says. These practical solutions encourage more farmers and landowners to add pollinator habitat. Fredericks adds, “On most farms, between 3 to 15 percent of fields are consistently unprofitable. When you transform these challenging areas into pollinator habitat, you improve your farm’s profitability.” Much of this profit boost comes from reducing input costs in low-producing areas that work better for native, perennial plants than row crops. These habitat areas also attract other species of butterflies, deer, birds and wildlife. PLANT YOUR OWN POLLINATOR GARDEN Make planting a pollinator garden as easy as 1, 2, 3 with these tips from the experts at Earl May Nursery & Garden Center. SET THE STAGE Scope out space for pollinator habitat in landscaping around your home, backyard gardens or porch planters. Understanding how much space you have can help you decide which plants to choose. PICK YOUR PLANTS Look for plants with bright colors that are nectar and pollen-rich. Pay attention to the bloom times, as it’s ideal to create a combination that will bloom all summer long. Asters, butterfly bush, butterfly milkweed, bee balm, cone flowers, Russian sage, salvia or tall garden sedum are great perennial options (come back every year). FOR YOUR CHANCE TO WIN A $ 100 EARL MAY GIFT CARD. Alyssum, cosmos, dahlia, lantana, pentas, verbena or zinnia are perfect annual options (plant every year). You can also purchase an Earl May pollinator mix seed packet with a variety of annuals. KEEP POLLINATORS IN MIND If you’re using fertilizers or managing pests, opt for pollinator-safe products. Read product labels and follow usage directions, including amounts and times to apply. showcasing delicious farm-raised proteins, dairy and vegetables. With these make-at-home versions of the eggy pie, each quiche mixture can be customized with favorite flavors or ingredients that are already in the fridge. Follow these five simple steps for ideas on creating a versatile protein-packed treat the whole family will enjoy. BUILD the BASE Whisk together 6 large eggs, 1 cup half and half, salt and pepper. PICK the PROTEIN Add 1 cup of cooked, browned and drained meat of choice to the base mixture. Consider bacon, sausage, ground pork, ham, ground beef, steak slices or ground turkey sourced from an Iowa farm, of course! ADD the VEGGIES Add 1 to 1 1/2 cups of chopped vegetables to the base mixture. Choose a combination of scallions, onions, bell peppers, broccoli, snow peas, baby spinach, edamame, sundried tomatoes, cherry tomatoes, mushrooms, potatoes or squash. Add fresh herbs and garlic to kick up the flavor. CHOOSE the CHEESE Add 1/2 to 1 cup of cheese to the base mixture. Choose from shredded cheese, grated Parmesan, cream cheese chunks or feta. TIP: Consider adding 1 cup of cooked grains, such as quinoa, brown rice, wheat berries or wild rice for a sturdier finished product. In a large mixing bowl, whisk together eggs, half and half, seasoned salt and black pepper. Add steak pieces, bell pepper, scallions and cheese. Fold together until combined. Pour mixture into halved bell peppers, bake at 350°F for 40-45 minutes. Makes 8 bell pepper halves. In a large mixing bowl, whisk together eggs, half and half, seasoned salt and black pepper. Add sausage, bell pepper, scallions, parsley and cheese. Unfold store-bought frozen puff pastry, place gently over a 4” tartlet ring mold. Lower puff pastry down into ring, do not stretch. Trim excess. Dock puff pastry gently with the tines of a fork, taking care not to pierce completely through. Insert parchment and pie weights or dry beans and parbake puff pastry at 400°F for 12 minutes. Remove from oven and pour egg mixture into parbaked puff pastry and return to oven to continue baking at 400°F for 15-20 minutes until pastry is golden brown and egg mixture is set. Makes 10 pastries. In a large mixing bowl, whisk together eggs, half and half, seasoned salt and black pepper. Add turkey, scallions, olives, peppers, parsley, feta cheese and quinoa. Fold together until combined. Children dressed in traditional Dutch clothing participate in a street performance during Pella Tulip Time. in authentic costumes, sing and dance in lively performances to celebrate the heritage that is the foundation of Pella. The Pella Historical Society has been organizing Tulip Time since the event began. As magnificent as the costumes are, the 350,000 tulips strategically placed throughout the city are a visual showpiece and work of art. The tulips, which primarily come from the Netherlands, are replanted every year to maintain their abundant size and vibrancy. THE VERMEER WINDMILL STANDS 126 FEET TALL AND IS THE TALLEST WORKING WINDMILL IN THE U.S.
GEMS OF THE COMMUNITY Another impressive focal point of the community is the Vermeer Windmill, which stands 126 feet tall and is the tallest working windmill in the U.S. A notable spot on the Marion County Foodie Trail, the windmill was built in Holland and shipped to Pella. Complete with a food license, 500-600 pounds of flour is produced annually at the mill. About 90 percent of the flour goes to Jaarsma Bakery, which bakes Windmill Bread from the flour. The rest is sold to people who visit the windmill. “About 20 volunteer millers work at the windmill. They go through intensive training over two to three months with a master miller to learn how to operate the mill, run the sails and understand how the wind affects production,” Van Kooten shares. Olieballen are a type of Dutch doughnut hole or fritter typically eaten from early December through the New Year. Some olieballen contain bits of apple or currents, and all are sprinkled with powdered sugar. When raisins or currents are used in olieballen, they are often soaked in rum overnight. Poffertjes resemble silver dollar pancakes. These mini pancakes are cooked in a heavy, cast-iron pan with divots. The semi-circular indentions in the pan help the pancake dough puff up. Poffertjes are brushed with melted butter and dusted with powdered sugar. Hailing from the South Holland town of Gouda are stroopwafels. These thin, waffle-like wafers are pressed together with caramel syrup or stroop. They are particularly known for being an afternoon pick-me-up that are warmed up over a cup of coffee before enjoyed. John Ulrich brought his treasured recipes from Europe to Pella in 1868. He perfected the craftsmanship of smoking meats and offered excellent service as he carried his products in a basket throughout the area to sell to locals. Soon, word of his quality product spread and people began to travel lengthy distances to have a taste of the Dutch history. By 1884, Ulrich had a butcher shop in downtown Pella to create and sell his now-famous meats. Lucas Van Wyk, a co-owner of Ulrich’s Meat Market, pulls bologna from a smoker. The business is the oldest retail store in Pella. Above right: Sarah Talma holds Ulrich’s famous smoked bologna. PELLA’S SECRET RECIPE How does a community of this size continue to thrive and attract worldclass talent for many of Pella’s global companies? Van Kooten says the recipe for success is straightforward. “Our manufacturing facilities are multigeneration family businesses, which have tremendous pride in their town. Our residents want to see Pella prosper while preserving and sharing our Dutch heritage,” Van Kooten explains. “If we lost that, Pella wouldn’t be what it is. The authenticity is what draws people in.” The Dutch heritage and farm culture are still predominant in Pella. Many Dutch families and companies still have koffietijd (coffee time) at 9:30 a.m. and 3:30 p.m. every day. Authentic. It’s certainly a fitting adjective for this charming community. When visiting, plan to stay awhile. There will be a cup of coffee waiting to be enjoyed! CENTERPIECE OF THE CITY: PELLA’S FOOD SCENE ULRICH’S MEAT MARKET Ulrich’s Meat Market – located on the south side of the town square – is the oldest retail store in Pella, built upon a smoked meat tradition that began 150 years ago with the Genuine Pella Bologna creation. Two smokers add a unique flavor to their products, and the inviting smell of fresh-smoked meat draws crowds. Ulrich’s Meat Market offers a variety of award-winning smoked meat products including Genuine Pella Bologna, dried beef, summer sausage, bratwurst, beef sticks, beef jerky and fresh meats ready to be cooked on the stove, oven or grill. A wide selection of specialty cheeses are also available from locally made Gouda or cheddar to cheese imported from Holland. Mike Bandstra, co-owner and head cheesemaker at Frisian Farms, turned a passion of working with dairy cows and his Dutch heritage into a “gouda” opportunity. Left: Cindy Reed Shull holds Dutch Letters at Jaarsma Bakery. with wood. After the ashes were brushed out, the bread was put in to bake, followed by the buns, Dutch Letters, cookies, and finally, rusks as the ovens slowly cooled down before re-firing. The bakery also served as a coffee shop and living quarters for the family. In those days, the Dutch Letters were made only as a special treat for Sinterklaas Day (the Dutch Santa Claus Day) on Dec. 6. They are typically shaped into an “S” for “Sinterklaas.” Jaarsma Bakery has been located on Pella’s town square since 1948. Frisian Farms Gouda. Their famous Gouda cheese is a semihard cheese named after a Dutch town in the province of South Holland and accounts for more than 60 percent of the cheese produced in the Netherlands. Frisian Farms, founded by two brothers – Mike and Jason Bandstra – who grew up on a small dairy farm south of Pella, has mastered the art and science of cheesemaking. The brothers even hosted a Dutch cheesemaker at their farm so they could perfect their process. When visiting the area, plan an overnight stay at The Cheesemaker’s Inn. Originally the heart of a dairy farmstead, the turn-of-the-century, craftsman-style home was elaborately customized a century later to accommodate guests who seek the highest levels of comfort and modern amenities. Guests will wake up to a hot and hearty breakfast made from Dutch family recipes featuring the freshest products from Frisian Farms dairy and local gardens. Harmon Jaarsma founded Jaarsma Bakery more than 120 years ago. The bakery is known for its Dutch Letters – a traditional puff pastry made with moist almond paste filling and sprinkled with sugar. WHILE MOST OF AMERICA IS WATCHING THE MORNING NEWS OR A RECORDED MINI-SERIES, DUANE OHNEMUS IS WATCHING A LIVE FEED OF COWS IN HIS BARN. fter glancing at the TV one last time, Duane Ohnemus pulls the laces of his leather boots tight. The TV is the first thing he looks at when he wakes up and the last thing he sees before going to bed during calving season. In late winter and early spring, Ohnemus, a cattle, soybean and corn farmer from Milo, is in the midst of calving season. The two to three-month process demands constant attention and braving harsh weather. His TV provides a video feed of the barn, allowing him to keep an eye on his “maternity ward” while saving trips to the barn for emergencies. He is quick to say the technology helps, but it will never replace in-person welfare checks to monitor labor and ensure calves are healthy. a great sense of pride in the farming foundation his ancestors started nearly 150 years ago. He wears a lumbar support belt and is as careful as possible because he can’t afford to be sidelined. The day ends much like it started. Feeding the cattle and doing health checks before going into the house for a hot meal and, of course, watching the TV. Editor’s note: This story was originally shared by the Iowa Soybean Association in Spring 2016. Duane Ohnemus continues to farm near Milo and his dedication, determination and passion for calving remains strong today. tofu, protein powder or soymilk. and a high smoke point. CANNED SOYBEANS TO MISO, THERE IS TRULY SOMETHING FOR EVERYONE. SOY PROTEIN CAN EASILY BE PART OF A HEALTHY DIET. High fiber and protein content helps satisfy hunger and control appetites. Healthy polyunsaturated fat lowers blood cholesterol levels and may reduce the risk of developing diabetes. Amino acids, vitamins and minerals, including omega-3 fatty acids, calcium, iron, zinc and B vitamins, especially thiamin, folate and B-6. Phytonutrients, which are nutrients found in plants and have been scientifically proven to help prevent disease. expert Anne Hytrek, MSEd, RD, LD, CDE and a registered dietitian with Hy-Vee at Ankeny Prairie Trail gives the scoop on incorporating superstar soyfoods into a well-balanced diet. Why should people consult a professional before making changes to their diet? Everyone’s bodies are different, so there isn’t one blanket recommendation to make when it comes to diets. A dietitian can be a helpful guide. Besides working with a dietitian, it is important that people consult their doctor and pharmacist. BASED ON SCIENTIFIC LITERATURE, THE AMERICAN INSTITUTE FOR CANCER RESEARCH AND THE WORLD CANCER RESEARCH FUND HAVE CONCLUDED THAT CONSUMING SOYFOODS AFTER A BREAST CANCER DIAGNOSIS MAY REDUCE RECURRENCE AND IMPROVE SURVIVAL. A doctor can give recommendations on whether to eat specific foods as it pertains to the patient’s health. A pharmacist can tell a patient if eating certain foods will interact with any medications they are taking. How can dietitians help people add more soy to their diets? Whether in a full meal or an afternoon snack, protein should come from a variety of foods. One of the first things I tell people asking about soy is that soyfoods are rich in protein and fiber and there are a variety of products on the market. pod in soybean oil, garlic, onion powder and salt and pepper to taste. Roast at 400 degrees F for 15 minutes. 1 teaspoon ponzu 1 teaspoon Kombucha (fermented tea blend) 1 teaspoon soybean oil 1 teaspoon Asian (toasted) sesame oil 2 teaspoons low-sodium soy sauce 1 teaspoon hot chili flakes Drain tofu for 5 minutes. In a blender or food processor combine all ingredients and blend until smooth. Serve immediately over shredded cabbage salad. Makes 2½ cups of dressing. beans The U.S. is one of the world’s top soybean producers. And Iowa farmers are among the nation’s best at growing soybeans, producing around 14.5 percent of the country’s total. Most of the soybeans grown in Iowa are different than the soyfoods at the grocery store. The bulk of soybeans grown in Iowa are crushed and separated into meal and oil. The meal becomes feed for livestock like pigs, poultry, cows and even fish. The oil from these feed-grade soybeans is used in many different products, from biodiesel and vegetable oil to tires and mayonnaise. The meal can also be used in products like protein bars and soy flour. A small percentage of Iowa’s soybeans are foodgrade. But the state’s soybean-growing neighbors to the north — Minnesota and North Dakota — are two of the top U.S. food-grade soybean producers. Those beans are destined to become soyfoods such as soynuts, soymilk, tofu, tempeh or miso. Both feed- and food-grade soybeans are left to dry in the fields before harvesting, creating the richly colored, golden-brown fields covering the state’s countryside during the fall. Food-grade beans, which are higher in protein content, are meticulously managed and inspected throughout the growing season. EDAMAME IS A SPECIFIC VARIETY OF FOOD-GRADE SOYBEANS THAT PRODUCES LARGER SEEDS, SWEETER FLAVOR AND CREAMIER TEXTURE. IN SOYBEAN PRODUCTION, ACCOUNTING FOR AROUND 14.5% OF ALL SOYBEANS GROWN. 42,000 IOWA FARMERS GROW SOYBEANS. eading and understanding food labels takes more time and effort today than the actual task of shopping. It’s also very depressing. Take for instance those shrinking portion and serving sizes? Seriously, who drinks just one-third of a can of AriZona’s Red Apple Green Tea or calls it quits after just two Girl Scouts’ Lemonades cookies? If only. Aaron Putze, APR, serves as communications director for the Iowa Soybean Association. He was raised on a farm near West Bend and lives in Waukee with wife Crystal and children Garrett, Grant and Jaelyn. He is also the author of the book “Destined for Greatness,” the biography of Hawkeyes’ great Chuck Long. debate and too often an argument. In the spirit of full disclosure, I’m OK with enjoying foods that include genetically modified ingredients. People and institutions who are objective and much smarter than me (e.g. scientists, world scientific bodies, and U.S. and global health organizations) are nearly unanimous in their agreement that such products are every bit as safe and just as nutritious as their nonGMO counterparts. There have also been many benefits derived from modifying apples, potatoes, corn, soybeans and summer squash. They include reducing manual, on-farm labor and staving off pests and diseases that can decimate yields and increase hunger and malnutrition, particularly in developing countries. That said, I respect those who have a different opinion on the subject. I don’t judge the decisions people make when shopping. Purchasing and enjoying food is uniquely personal. And why the fuss? Farmers and food retailers, after all, have risen to the occasion. If you want non-GMO, the selections are endless whether you shop at the nearby supermarket or local farmers’ market. earlier this winter by the Iowa Food & Family Project shows a similar trend among shoppers. Fifty-three percent of respondents say non-GMO labeling has no influence on their purchase decisions. Conversely, just 38 percent said they were more likely to purchase food items labeled nonGMO. That’s a 15-point spread, the largest in the survey’s eight-year run. What makes this finding even more significant is that survey participants are not just casually interested in food topics. Ninetyone percent self-purport to be their household’s primary purchaser of groceries. Ironically, as more shoppers seek out info on food packaging, they are also becoming increasingly jaded about most claims made by food packagers and marketers. While 75 percent of survey respondents said they seek out information on food labels, a whopping eight of 10 say food labels are misleading. Food labels matter, but consumers are growing wise to deceptive claims. Food packagers and retailers must resist becoming misleading or risk alienating the very same customer they crave. Speaking of crave, please pass the Lemonades. A walk through the grocery store exposes shoppers to hundreds of product labels and packaging callouts. 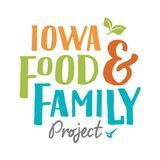 AND YOU’LL BE ENTERED TO WIN AN IOWA FOOD & FAMILY PROJECT APRON. 6 tablespoons butter, melted Preheat oven to 350 degrees F with a rack in the center. Brush the bottom and sides of a 9-inch springform pan with some of the melted butter; set aside. In a food processor, pulse graham cracker pieces until fine. Add sugar and remaining butter, pulse to combine, then pour into prepared pan. Pat crumbs evenly on the bottom and partially up the sides of pan and bake until golden and fragrant, 12 to 14 minutes. Remove and set aside; leave the oven on. In a large bowl, beat cream cheese, sugar, lemon juice and zest with an electric mixer until smooth. Add eggs one at a time, mixing just until incorporated after each addition. Blend in sour cream and vanilla and mix for 1 minute. Pour batter into graham cracker crust and place pan in the oven; set a pie plate filled with 3 cups of water in the oven next to the cheesecake. Bake for 1 hour or until the sides are set but the center is still somewhat unset. Turn oven off, prop the door open and let the cheesecake cool for 1 hour inside the oven. Chill the cheesecake for 4 hours, loosely covered with plastic wrap. For the topping, in a mixing bowl, fold together the pie filling, raspberries and vanilla. Chill until ready to use. 1 cup heavy cream 3 tablespoons confectioners’ sugar 1 teaspoon vanilla extract In a mixing bowl, whip the cream until soft peaks form. Add sugar and vanilla and continue to whip until stiff peaks form. To assemble, remove sides of the springform pan and transfer the cheesecake to a serving platter (do not remove cheesecake from the pan’s base). Spoon cherry filling in the center of cheesecake, leaving a 1-inch margin around the edges. Pipe rosettes of vanilla whipped cream in the margin. Slice the cheesecake using a sharp, thinbladed knife, dipping the knife in hot water before and after each cut. Refrigerate any leftover cheesecake. HEALTHY LIVING AT THESE COMMUNITY EVENTS. Make choices for you and your family. They account for up to 70% of air quality problems. The fuel you choose matters. Compared to gasoline, American Ethanol reduces greenhouse gas emissions by almost 50%. That’s the equivalent to removing more than 9 million cars from the road for a year, which means cleaner air for your family. Ethanol is good for vehicles. It provides higher octane for cleaner engines, better winterizing and increased overall performance. If you drive a 2001 or newer vehicle, pick E15 at the pump for the greatest benefit.